"We saw the Earth destroyed, and in a heartbeat everything and everyone we knew was gone. There were five of us, the crew of the space shuttle Odyssey, and we were the only survivors. A mysterious being who called himself The Seeker rescued us and sent us back in time. And now we have five years to live over, five years to discover who or what destroyed the Earth, five years to stop it from happening again..."
Premiering during the summer of 2002, Odyssey 5 aired only 13 episodes on Showtime before receiving the axe from the cable network. Starring Peter Weller (Robocop) as Astronaut Chuck Taggart, this series began with a knockout premise but was barely able to scratch the surface of its potential. The final six episodes aired in the fall of 2004 and moved the story further, but they lacked any true closure. Created by genre veteran Manny Coto (Enterprise, 24), this ambitious drama followed the experiences of five characters who are the lone survivors of the Earth's destruction. Death appears imminent aboard the damaged shuttle, but an encounter with a mysterious being called The Seeker (John Neville) gives them a reprieve. He sends them five years into the past with the hope that they can prevent the end of the world. Taggart's space shuttle Odyssey crew includes fellow astronauts Angela Perry (Tamara Craig Thomas) and his son Neil (Christopher Gorham), journalist Sarah Forbes (Leslie Silva), and geneticist Kurt Mendel (Sebastian Roche). This unlikely group of misfits is the world's only hope for survival, which gives us little chance to make it. Each character faces personal challenges separate from their primary mission that make things even more difficult. Chuck's relationship with his wife Paige (Gina Clayton) becomes strained when he's constantly leaving to investigate strange happenings. He also must deal with the "golden boy" son Marc (Kenneth Mitchell), who has no desire to become an astronaut but can't speak up to his parents. This situation originally ended very badly, and signs aren't promising for a better resolution. Neil is back with his high-school girlfriend Holly (Lindy Booth), who is both attracted by and confused by his more adult attitude. The toughest dilemma occurs for Sarah, who knows that her young son will die from cancer in a few years. She also is back living with her first husband, who is bewildered by her desire to test their healthy son for cancer. This conflict is especially difficult and generates a nasty rift within their doomed relationship. The series begins with the extended pilot episode, which introduces the lead characters working on the Odyssey space shuttle. Following the catastrophe, they immediately face troubles when they return to five years into the past. The chemistry between the actors appears a bit rough during the opening story, but it still contains some tense, action-packed moments. Also, the special effects utilized for the Earth's destruction are especially impressive for a cable series. The early episodes are a mixed bag, with several clunkers mixed among some compelling tales. Symbiosis introduces the child with special powers storyline that has been done much better on earlier science-fiction shows. Rapture is another dull entry with its use of crazed high schoolers infected by a nasty drug. It appears more suited for a lesser syndicated series and includes few original moments. Luckily, these episodes are the exception and can be forgiven when you consider several remarkable entries. The series' best story is The Choices We Make, which introduces a mysterious figure with stunning knowledge about each character's most troubling events in the past. Sci-fi veteran Rick Worthy (Stargate SG-1, Battlestar Gallactica) does an excellent job as the being, and the intriguing set-up allows the actors (especially Weller) to showcase their talents. Odyssey 5 had only scratched the surface of its potential when Showtime pulled the plug on its promising existence. During the 2nd half of the 19-episode run, the actors convey endearing traits that could have developed even more in upcoming seasons. Sebastian Roche is initially grating as the arrogant Kurt, but he becomes surprisingly likable as the story progresses. His penchant for gambling and women actually keeps the character realistic and understandable. Tamara Craig Thomas appeared a bit stiff in the early episodes, but she also grows more confident and magnetic in the later shows. The writers also take more chances and aren't afraid to keep the enemy mysterious. The chilling L.D.U.-7 sends the gang into a maximum security prison that turns out to be something even more terrifying. The intensity builds to a feverish pitch and delivers an effective climax that gives away a little, but retains an air of enticing mystery. This episode perfectly exemplifies the allure of a series that had only begun to shine when it reached its premature end. Image Transfer Review: Odyssey 5 offers an impressive 1.78:1 anamorphic widescreen transfer that presents the world's destruction in grand fashion. The individual episodes' limited budgets lessen the mind-blowing effects available, but they still provide a solid experience. The amount of grain is very minimal, and even the darker scenes remain sharp during each episode. The images are bright and effective, with only a few minor defects appearing on the screen. Audio Transfer Review: This release includes a strong 5.1-channel Dolby Digital transfer that presents the numerous tense moments effectively. The rear speakers do receive a significant amount of use, which is a bit surprising for this television release. The dialogue is clear and utilizes plenty of volume, which is always a welcome aspect. Also, Japanese viewers receive a solid 2.0-channel Dolby Surround track, which lacks the other's complexity but still is acceptable. Extras Review: This collection's only extra feature is a feature-length commentary from creator Manny Coto and star Peter Weller on the pilot episode. Thankfully, the duo performs well and offers considerable insight into the series. Coto discusses many planned scenarios for future seasons but avoids revealing any huge secrets because he hopes to revive the story in some form. Weller speaks intelligently regarding his participation and gives plenty of worthy details about his role. His comments waver towards being too praiseworthy, but they never cross the line into cringe-inducing territory. It's unfortunate that these speakers (and other cast members) could not offer at least a few more commentaries about the later episodes. But this enjoyable track should lessen the sting for fans itching to learn more about their beloved series. 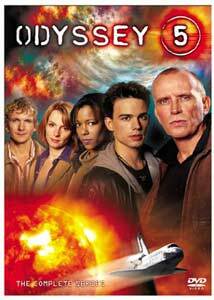 If you can handle the frustration of becoming invested in a series that remains incomplete, Odyssey 5 definitely warrants a viewing. Would our heroes have defeated the nasty artificial beings and saved the world? The answer will currently remain a mystery. This show falls a notch below the premier sci-fi series (Firefly, Battlestar Gallactica), but the story still offers plenty of memorable scenes. Pick up this DVD collection, and perhaps Manny Coto will get a chance to resurrect Taggert and the gang someday.